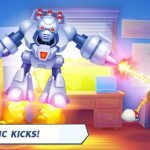 Kick the Buddy: Forever is the latest installment in Playgendary’s highly addictive series of doll-beating games. The game follows the basic mechanics of the original where you just need to repeatedly beat up Buddy the doll using a wide range of weapons, including guns, swords, and even bombs. Of course, the game naturally comes with upgraded graphics, new interactions with Buddy, additional wacky weapons, different backgrounds, and even more features. It’s a great mobile game to relieve some stress, and you won’t feel any guild because Buddy will always have that signature grin on his face while you beat him up. Don’t forget that there are also plenty of customization features that you can unlock in order to keep things fresh and exciting. If you need help in finding better ways to dish out abuse, you can always rely on our Kick the Buddy: Forever cheats, tips and tricks for some help! If you have played any of the previous games in Kick the Buddy series, you might be surprised to discover that tapping on Buddy now deals quite a bit of damage. You also have a chance to earn extra coins when you tap on him. If you feel like just farming for coins, you can do so by just repeatedly tapping on Buddy until you are satisfied with your earnings. You can save the use of weapons later one when you are in the mood for more destruction. There are a lot of weapons available for you to unlock in Kick the Buddy: Forever. Of course, unlocking more weapons means being able to beat up Buddy in different and exciting ways. Some weapons can be bought using coins and gems. Others can be unlocked by watching a certain number of video advertisements. If you don’t mind whipping out your credit card to make things quicker, you can also unlock the advertisement weapons using gems. We have listed the different weapons below to help you acquire all of them. Beretta – Purchase with 500 coins. AK47 – Purchase with 3,000 coins. Uzi – Purchase with 2,500 coins. Taser – Purchase with 4,000 coins. Golden AK47 – Purchase with 8,000 coins. Thompson (Tommy Gun) – Purchase with 6,000 coins. Golden Uzi – Purchase with 10,000 coins. Mace – Purchase with 1,000 coins. Katana – Purchase with 6,000 coins. Frost Axe – Purchase using 9,000 coins. Golden Mace – Purchase with 5,000 coins. Bow – Purchase with 2,000 coins. Dark Scythe – Purchase with 4,000 coins. Statue – Purchase with 10,000 coins. Lab Flask – Purchase with 2,300 coins. Chainsword – Purchase with 2,500 coins. Harpoon – Purchase with 3,000 coins. Land Mine – Purchase with 500 coins. Black Bomb – Purchase with 2,500 coins. Plasma Grenade – Purchase with 5,000 coins. Molotov Cocktail – Purchase with 2,500 coins. Golden Grenade – Purchase with 5,000 coins. Matryoshka Bomb – Purchase with 7,000 coins. Black Mine – Purchase with 2,000 coins. Mega Bomb – Purchase with 20,000 coins. Monkey Bomb – Purchase with 4,500 coins. Semtex – Purchase with 5,000 coins. Plasma Gun – Purchase with 10,000 coins. Self-made Robot – Purchase with 21,000 coins. Adrenaline Gun – Purchase with 6,000 coins. Space Laser – Purchase with 8,000 coins. Bacteria – Purchase with 8,000 coins. Reap Guns – Purchase with 10,500 coins. Goblin Bomb – Purchase with 8,500 coins. Hell Gun – Purchase with 10,000 coins. Candy Cane – Purchase with 1,300 coins. Icicle Gun – Purchase with 5,500 coins. Plantus Predatus – Purchase using 12,000 coins. Watermelon – Purchase using 3,000 coins. Paintball Gun – Purchase using 3,500 coins. Gas Nozzle – Purchase using 6,000 coins. Petroleum – Purchase using 1,500 coins. Pancake – Purchase using 3,000 coins. Keyboard – Purchase using 2,500 coins. Make Buddy – Most expensive coin weapon. SPAS-12 – Purchase with 300 gems. M134 Minigun – Purchase with 500 gems. Golden Minigun – Purchase with 800 gems. Buzzsaw – Purchase using 240 gems. Shuriken – Purchase using 100 gems. Golden Shuriken – Purchase with 200 gems. Airstrike – Purchase with 500 gems. TNT – Purchase with 400 gems. Tank – Purchase with 400 gems. Fuel Tank – Purchase with 400 gems. Nuclear Bomb – Purchase with 800 gems. Nuclear Weapon – Purchase with 1,000 gems. Brotato Gun – Purchase with 300 gems. Mars Rover – Purchase with 500 gems. Drone – Purchase with 600 gems. Teleport – Purchase with 200 gems. Golden Droid – Purchase with 3,000 gems. Golden Trident – Purchase with 600 gems. Eaglerang – Purchase with 200 gems. Spider Web – Purchase with 200 gems. Whistle Arrow – Purchase with 300 gems. Earthquake – Purchase with 7,500 gems. Lightning – Purchase with 600 gems. Tornado – Purchase with 360 gems. Spider Web Black – Purchase with 400 gems. Christmas Tree – Purchase using 60 gems. Party Popper – Purchase using 80 gems. Mutant Rabbit – Purchase using 600 gems. Crawler – Purchase using 300 gems. Bear – Purchase using 400 gems. Wasps – Purchase using 400 gems. Golden Crawler – Purchase using 500 gems. Soda – Purchase using 100 gems. XPOGO – Purchase using 100 gems. Gas Chamber – Purchase using 600 gems. Sound Generator – Purchase using 600 gems. Electric Chair – Purchase using 800 gems. Flamethrower – Earn through card bonuses. Chainsaw – Earn through card bonuses. Buddy’s Pan – Earn through card bonuses. Whip – Earn through card bonuses. F1 Grenade – Earn through card bonuses. Alien Blaster – Earn through card bonuses. Plasma Sword – Earn through card bonuses. 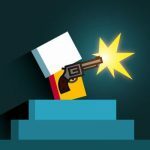 Firework Gun – Earn through card bonuses. M16 – Watch 5 video advertisements or purchase with 200 gems. Balalaika – Watch 10 video advertisements. Loudspeaker – Watch 10 video advertisements. Holy Grenade – Watch 20 video advertisements. Droid – Watch 60 video advertisements. Finger – Default weapon. No need to unlock. Mjolnir – Log in for three days in a row. Watch video advertisements to speed up the daily login reward bonus. Bazooka – Subscribe to the game’s Instagram account. Vampire Bats – Subscribe to the game’s Instagram account. Needle Bomb – Log in for two days in a row. Cloning – Invite five friends to play the game. Psy Blades – Login for several days in a row. Magic Cards – Unlock using VIP status. Sign up for VIP then cancel before the end of three days to get this without paying real money. Telekenisis – Claim as a log in reward. Firecracker – Unlock using VIP. Use the free VIP trial for this one as well. Cactus – Unlock using VIP. Use the free VIP trial for this, too. Now that you have seen the list of weapons, you are probably confused as to which one you should use. If you just want to have fun, feel free to try out each one and watch what they do to Buddy. If you are trying to be efficient, however, then you may want to choose the Vampire Bats. This weapon automatically hits Buddy repeatedly until he dies. That means you get to earn a lot of coins for every hit and get added earnings once he is knocked out. As we mentioned earlier, you can sign up for the VIP trial which is free for the first three days. If you decide to keep the VIP membership, you will have to pay a weekly fee through the Google Play Store or the Apple App Store. If you have no plans of spending real money, make sure you cancel the VIP membership before the end of the third day. Don’t worry because you will get plenty from the three-day trial. VIP status gives you access to three additional weapons. You also get 100 gems and 1,000 coins per day. That means you get 300 gems and 3,000 coins for free before you need to pay for the membership. The VIP trial is a one-time trick that you can use to earn free gems. Since you will be needing thousands of gems in order to unlock all the weapons, you have to take advantage of other ways to earn gems for free. One way to earn more gems is by simply playing every day. Daily login rewards change all the time, but they often include a handful of free gems. It may not seem like much but they all pile up if you keep at it. Another way to earn free gems is to earn card bonuses. You earn different rewards from cards, including weapons, but they also sometimes include gems. In order to earn a card bonus, you will have to kill Buddy. Keep in mind that using the same weapon over and over will eventually disqualify you from earning more card bonuses. The game will tell you if you have used the same weapon to kill Buddy too many times. When that happens, just find a different weapon to kill him with, and let the fun continue. A final way to earn more gems for free is by keeping an eye out for bonus characters. You will sometimes encounter the Pinata or the Candy Egg. They are a lot tougher than Buddy, but when you do kill them, they give you a lot of rewards. You will also occasionally see a UFO, or maybe even Rick and Morty. Drag Buddy towards their attacks and you will deal a lot of damage, allowing you to kill him more quickly. Unlocking everything in Kick the Buddy: Forever isn’t an easy task, but with the help of the tips and tricks above, you will be able to succeed in no time! Do you know any other hints for the game? If so, feel free to let us know in the comments below!